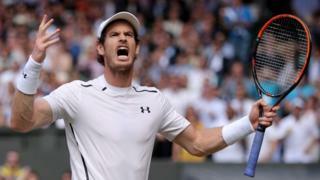 When you host what is arguably the most famous tennis tournament in the world - Wimbledon - it would be tempting to rest on your sporting laurels and let things tick along as they always have done. Not only is it the longest-established of the four Grand Slam tournaments, but the Championships also enjoy sell out crowds and hospitality every year. The two-week long event is broadcast to millions of fans, and made an operating profit of £42m last year. So, things certainly look rosy in the green SW19 garden, with further healthy signs being a 12% increase in the prize money pot this year to £31.6m. But income from broadcasters represents more than half of the event's turnover, and a small number of key broadcast markets, notably the UK and USA, provide the majority of that income. With this in mind, executives from tournament operator the All England Lawn Tennis Club (AELTC), are looking at new ways to grow awareness and interest in the tournament outside their current Anglo-centric heartlands. "We want to take the Wimbledon brand to new audiences and regions," Mick Desmond, AELTC commercial and media director, tells me. "It is not just about the people here at Wimbledon, where we have sold out all spectator tickets and all hospitality again. "We want to grow our global fan base, the same as the likes of Premier League football or NBA basketball are doing." He adds: "Tennis as a sport is in great shape. But we take a long term view in terms of strategy. "Not just in terms of developing physical infrastructure here on the playing site, but also about building our brand with a younger audience, and also with new audiences in different parts of the world, be it China or Colombia. "Disruption is everywhere in the modern world, and we always have to be thinking one step ahead." The financial reward from growing its global fan base, will come when Wimbledon signs new TV deals and sponsorship agreements, and is able to show that it can deliver a large and diverse customer base for its partners. "It all means that we add more value to our media rights, and it means we also offer more value to our commercial partners such as IBM or Jaguar," he says. And it is with long-term partner IBM, its official supplier of information technology, that the event is looking to use digital media to spread its message and engage with new fans. "We have been on a long digital journey over the past seven years," Mr Desmond says. He says that in 2010 Wimbledon had a very good website, but that it looked the same as the other Grand Slam tournament sites, also created by IBM. "We wanted to enhance the beauty and grace of Wimbledon. For those who could not be here in person, we wanted to give them the next-best experience," he says. "The reaction of fans has been very positive. But we are never happy. We wanted to raise the bar for 2017." Mr Desmond says that Wimbledon wants to provide a rich digital experience that ensures they connect with fans at the event and across the globe. IBM is also using all of the data and cognitive computing capabilities put in place for the Championship, to try and work out for fans the characteristics that it takes to be "a great champion". "We are democratising data for tennis and sports fans," says Alexandra Willis, head of content and digital at the AELTC. "We want to get under the skin of tennis matches at Wimbledon, and use digital to deepen engagement with fans." She adds: "We spend a lot of time trying to build our media assets. We are trying to reach a bigger, younger, more engaged audience." Meanwhile, social media content from the tournament is being adapted into a number of different languages. There will be Facebook pages for fans in Korea, Japan, India, and the Spanish speaking nations. And content is being produced for Weibo and Wechat in China, and for Japanese messenger service Line. "We are trying to inform fans," adds Ms Willis. "We are not just pushing content at them, we are tailoring what we do to different types of fans." With such a varied digital offering, there had been criticism in the past there was no actual wi-fi at the tournament grounds to help ease access to it. This year there will be three areas where public wi-fi is available. They are, from the entrance way at Gate 3 and along to the food court, in the ticket resale area, and at the west stand area of court 12. Organisers say they want to see how well this works, before looking to potentially expand wi-fi access in 2018. "We are not complacent about what we are doing with our media and digital assets," says Mr Desmond. "Our brand is the most important thing we have, we need to nurture and develop it. The more we can drive our content and brand, as other sports rights holders are doing, the more we can grow our audience. "And that can ultimately only help us commercially."